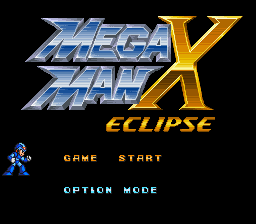 Mega Man X: Eclipse: Demo Release! Plays really smoothly! I'm impressed. Other than the awkward keyboard controls I'm forced into at the moment, it felt like a solid MMX game. Only played up to the midboss that destroyed me when I first fought it ^^; Will try again later. Only "bug" I noticed was the health bar is a little low on the left-hand side. Intentional (LOTS of planned health upgrades)? Glad you're enjoying it! You can change the controls in the options menu to your preference, or use any gamepad that uses Xinput. Now that you mention it, I guess the health bar is a little lower than normal. I'll make the adjustment, thanks for pointing that out! And there won't be any more heart upgrades than a normal X game. Its not working for me. As soon as I shoot a shot from megaman, there is a text saying code error. Could you help me please? It looks fantastic up until that point. I already love the music. That's a bug on my part. It's likely because your computer doesn't support shaders and I forgot to make the game check if the PC supports it before running one. I'm already working on an update for it and should be up by tomorrow. I just need to test on another computer. This might help you fix it too!